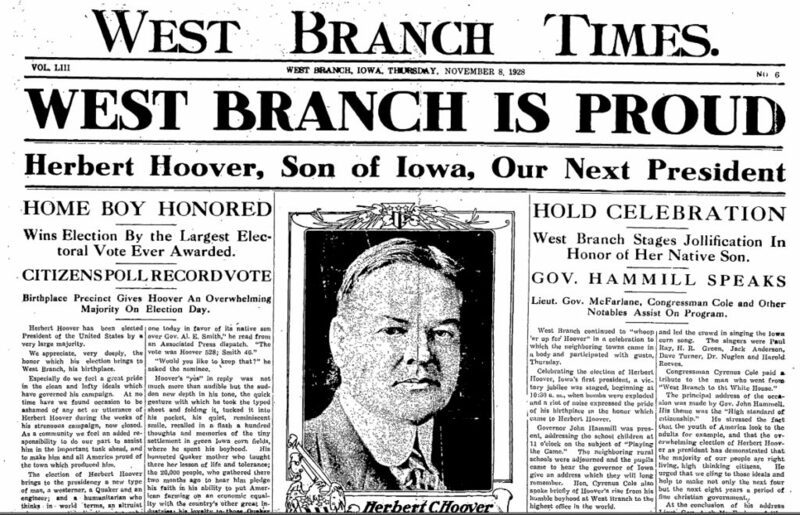 Recently added to the library’s services, the early issues of the West Branch Times and Local Record (the Times predating 1889) are now available online at westbranch.advantage-preservation.com/ or wbpl.org/times if you want to share a shorter URL. The historic archives are free and available to everyone through the link. The scanned issues currently cover the start of the paper in 1883 and goes until 1934. It is text and name searchable as well as browsable by date. The electronic archive of the West Branch Times was made possible through a grant from the Alliant Energy Foundation. Issues of the Times and the microfilm reels of the Times are kept by the Herbert Hoover Presidential Library and Museum. Thanks goes to the Library/Museum for their work with the preservation company. The project is also made possible through the approval and support of the West Branch Times. The current digital copies are available through 1934 with following issues yet to be scanned. The historic issues of the West Branch Times consist of over 100 reels and the process of scanning requires $95 per reel. With a total project cost of approximately $10,000, about $8,000 remains to be procured. While the West Branch Public Library is seeking grants for the remaining funding, if you would like to see the project completed sooner, the library would happily accept donations towards furthering the project. Additional scans will be conducted every 1/5th of the project or $2,000.